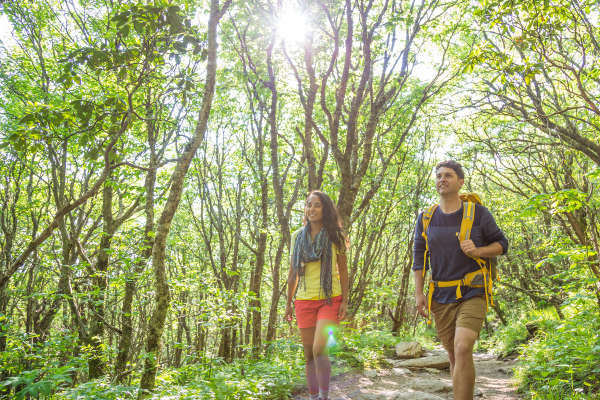 Check out this primer for new and unusual outdoor pursuits in one of the nation’s top outdoor vacation destinations: Asheville, North Carolina. Outdoor Town At-a-Glance: Sitting along the famed Blue Ridge Parkway and surrounded by one million acres of protected wilderness, Asheville’s backyard has the highest mountain peaks east of the Mississippi; thousands of miles of hiking and biking trails; unmatched biodiversity that brings a parade of mountain color from summer rhododendron blooms to fall foliage displays; and George Vanderbilt’s 8,000-acre playground at Biltmore Estate. Picturesque Picnic Trail Expands: Bearwallow Mountain Trail, a Hickory Nut Gorge-area trail known for its Instagram-worthy views, grazing cows and spring wildflowers, now has a new neighbor trail. The 3-mile Wildcat Rock Trail goes to a 100-foot waterfall, towering cliffs and awe-inspiring views. The trail is a national-award winner, receiving recognition for trail design and construction from the Coalition of Recreational Trails. Recently announced: Thanks to new Conserving Carolina conservation easements, this trail will extend across the mountain to connect to Bearwallow Mountain in the next few years. More info on the Bearwallow Mountain Trail. Go Off-Road Through Biltmore’s Backyard: NEW this summer, a two-hour-long Outrider Tour takes guests on remote off-road trails and roads on the grounds of America’s Largest Home via electric recumbent tricycle. MORE ADVENTURES COMING SOON TO BILTMORE: Falconry and fly fishing from a kayak! Pop-Up Gear Manufacturing: Diamond Brand Gear – whose storied 136-year history includes manufacturing the very first backpack for the Boy Scouts, as well as supplying the U.S. military in both WWI and WWII – has just opened a temporary “micro” factory downtown (through January 2019), offering a behind-the-scenes look at their production, as well as exclusive products available for purchase only at that location. Visitors can also get a hands-on experience sewing on their machines. ADVENTURE SAVINGS TIP: The nation’s largest outdoor-recreation company, Nantahala Outdoor Center (NOC) provides a full day of play with the “Nantahala Adventure Pass.” Visitors can combine four of their most popular activities, like rafting or mountain biking, while saving some bucks in the process. SUP Yoga on the World’s Third Oldest River: Wai Mauna, known for its sunrise Dawn Patrol stand-up paddleboard tours and six-person Party Barge, is offering SUP Yoga classes (NEW!) this season. The two-hour morning lessons include paddling instruction and a yoga session on top of anchored paddleboards along a calm stretch of water, led by professional instructors.